Today is the first day of a very brief training cycle. I am 5 weeks away from racing the 5 km event at the Scotiabank Vancouver Half Marathon. Believe it or not, this will actually be my first ever 5 km race. Based on recent performance on other race distances, I could break 25 minutes for the 5k distance. However, I’ll be training instead to go under 26:00. I think it’s a realistic challenge, especially considering the short span of time in which to train. I adapted a program that was published last year in an issue of Runner’s World. The miles-to-km pace conversion was a pain, but I think I calculated the appropriate paces for the various workouts. 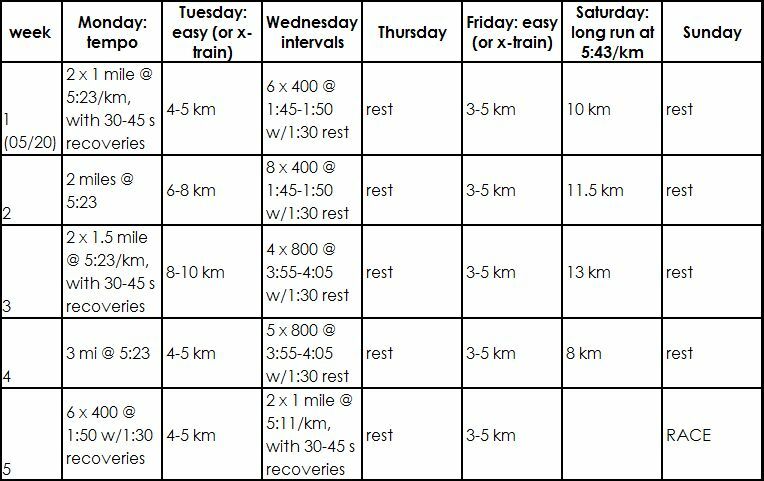 There isn’t much of a change from the last training cycle as there is one day for tempo, one day for intervals, and a long run done over goal race pace. Given my current runemployment status, and allowing for nice spring weather, I’m hoping to increase the number of my runs per week from three to four; a fifth day can be used for an easy run or cross-training. Do you think my approach will work, both for a first-time 5k, and the short period of time to train for it?